100% Organic Natural Moringa Oleifera Premium Natural Quality! MORINGA IS KNOWN AS THE MIRACLE TREE - Moringa Oleifera leaf powder contains all 8 essential amino acids - proteins, 18 total amino acids - proteins, 90+ nutrients - vitamins and minerals and 40+ antioxidants. It can have an alkalizing, energy boosting effect, as well as promoting a healthy, balanced metabolism. When the body receives the nutrients it needs, it's able to take care of the immune system to maintain overall health, not to mention a reduction in cravings. RAW, CERTIFIED ORGANIC, NON-GMO & GLUTEN FREE - Quality is critical for anything we put into our bodies. Our Moringa Oleifera capsules are the finest quality available coming from trusted small certified organic farms, after going through rigorous testing. All of our product is non-gmo and is 100% gluten free. This product is vegan friendly and 100% raw moringa leaf powder. NO fillers, preservatives, sugars, starch, artificial colors, flavors, corn, egg, milk, soy, yeast, wheat or grain. IT'S ALL ABOUT RELATIONSHIP - Valuing relationship is our #1 priority. Unlike some other brands, we vet our suppliers and manufacturers quite rigorously before taking the relationship further. Our highest aim is to provide you with the absolute best product and service available. We talk with our customers and take your feedback seriously. Your health and well-being is vital. We count it an honor and privilege to receive your trust regarding the things you put in your body. ALL NATURAL MORINGA LEAF POWDER - A natural multivitamin, Moringa has NO side affects. Start with ½ teaspoon upwards to 4 tablespoons per day. Consult a physician with any concerns. Increase slowly to avoid nausea. 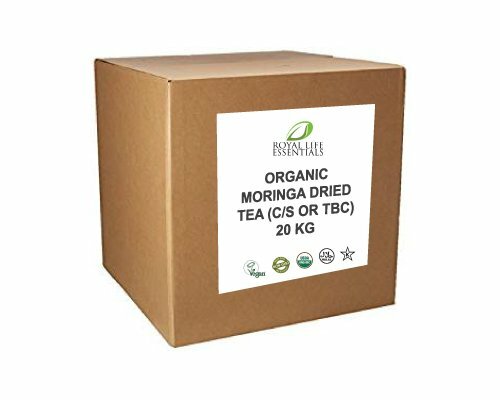 Not commonly known in the USA, Moringa Oleifera leaf powder will help enhance energy levels, detoxify your body, supports digestion, mental clarity, emotional well-being, balanced blood sugar levels and overall good health. GUARANTEED SATISFACTION - We want you to be happy and healthy! All of our Moringa Oleifera products are backed with a 30-day money back guarantee, if you are not satisfied for any reason. Simply return the product to us and receive a full refund. View More In Coffee & Tea Gifts. If you have any questions about this product by Royal Life Essentials, contact us by completing and submitting the form below. If you are looking for a specif part number, please include it with your message.